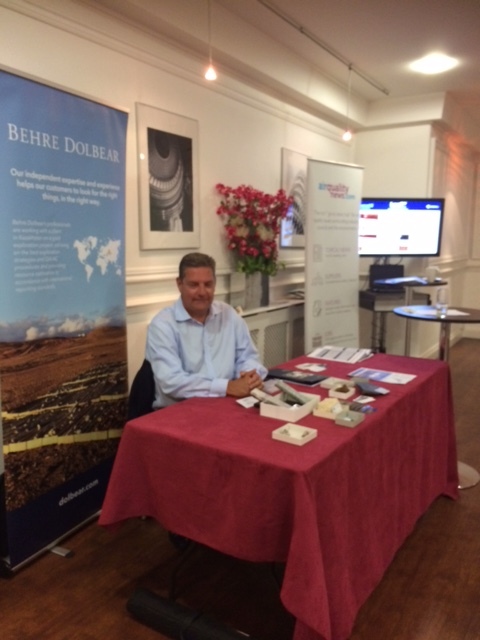 July 12th Behre Dolbear attended the LowCvp conference in London. It was a great opportunity to present our expertise in sourcing critical elements necessary for Electric Vehicle production. We are looking forward to working with members of Low Carbon Vehicle Partnership to promote responsible and efficient sourcing of metals. 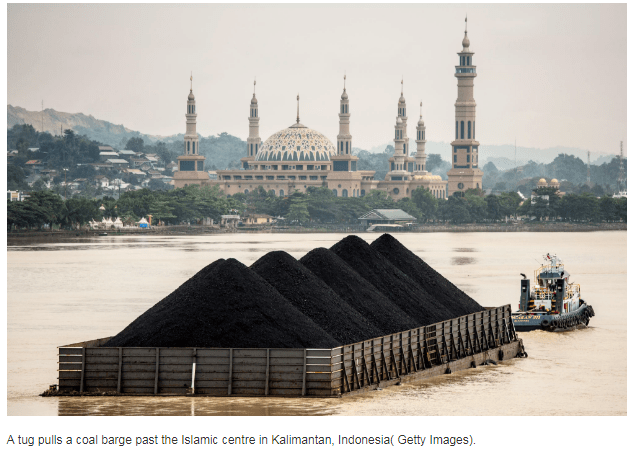 JAKARTA — Coal, one of the world’s most polarizing commodities, has now become an Asian irony. Efforts to curb use of the so-called black diamond in the West have been a boon for coal companies in the East, more so now that the benchmark price for thermal coal exceeded $120 per ton in July, the highest since 2012. 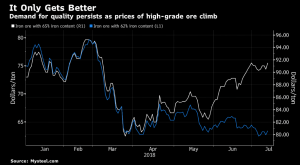 High-grade iron ore may spike to $100 a metric ton as China intensifies a clampdown on pollution by restraining industrial activity, adding further momentum to a trend that’s reshaped the global market in recent years and driven buyers in Asia’s top economy seek out better-quality material. 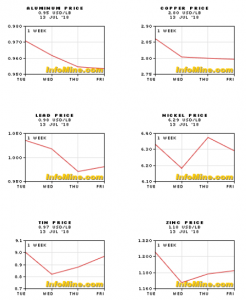 After sinking in March, top-quality ore with 65 percent iron content gained every month, hitting $91 a ton on Friday, and keeping it in positive territory this year even as global trade frictions mounted, according to Mysteel.com. In contrast, benchmark 62 percent ore has flat-lined in the $60s, and is down 14 percent. The divergence has exploded the gap between the two. 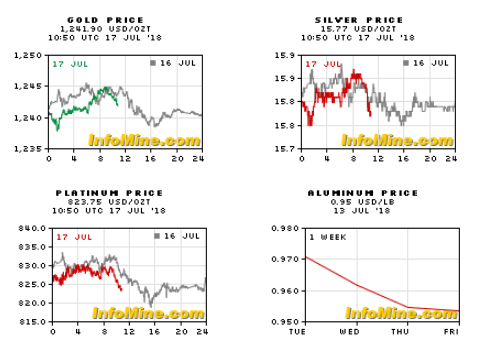 “Short-term spikes to this level are entirely possible in response to Chinese production and policy announcements,” said Paul Gray, vice president for iron ore markets at Wood Mackenzie Ltd., referring to the $100 mark for top-grade prices. While WoodMac’s view is that high-quality ore won’t trade in three figures on a sustainable basis, spreads are expected to remain wide. It said the strike led to a 12-day disruption in production and logistics across Brazil, although Vale had mitigated the impact with its supply chain flexibility. That covered the transfer of supplies between sites, alternative railway use to transport supplies, and adjustments to mining and milling rates. The ramp-up of S11D also boosted output, with Vale’s Northern System achieving record production of 46.2Mt for the quarter, up 11.4% year-on-year. Bernstein analysts Paul Gait and Jonathan Absolon said the iron ore volume had been 2.4% above their expectations. 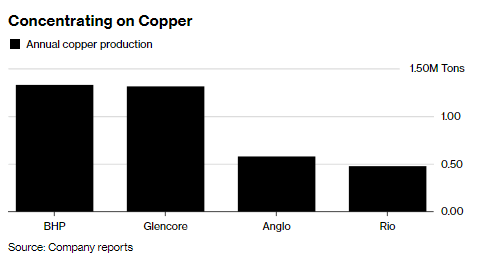 It’s the mining world’s biggest dilemma: everyone’s hunting for copper deals, but even the richest producers just can’t pull the trigger. The largest miners all say they’re bullish on copper and looking for growth in the metal that’s forecast to be in ever-greater demand as cities expand and electric vehicles gain traction. 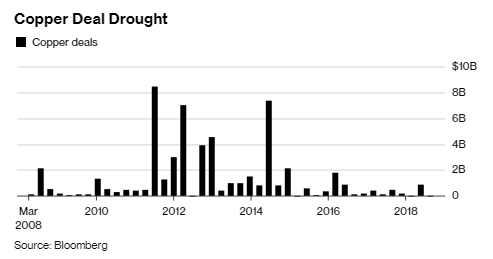 The industry has deep pockets for deals right now — Rio Tinto Group may end the year having raised $8.5 billion from asset sales and rivals like BHP Billiton Ltd. and Glencore Plc are churning out massive profits. So what’s the problem? For a start, nobody who owns a copper mine wants to give it up. Even when Glencore and Anglo American Plc were crippled by debt during the 2015 commodity slump, neither was willing to entertain an offer from Rio for their holdings in the giant Collahuasi deposit in Chile, according to people familiar with those talks, who asked not to be identified. Rio Tinto has reported a solid quarter of production, but said it was experiencing cost inflation across the business. Pilbara iron ore shipments on a 100% basis were up 14% year-on-year and 10% quarter-on-quarter to 88.5 million tonnes, above RBC Capital Markets’ forecast of 82.6Mt. Rio said the result was due to better weather and improved productivity. Shipments for the first half were up by 9% to 168.8Mt, and Rio flagged that full-year sales were likely to be at the upper end of guidance of 330-340Mt. 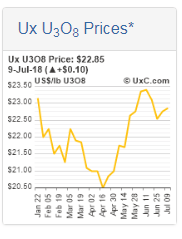 The average iron ore price achieved for the first half was US$57.90 per wet metric tonne free-on-board, equivalent to $63 per dry metric tonne. Lundin had earlier backstopped a C$1.5 billion (US$1.1 billion) cash and shares offer led by Euro Sun Mining, equating to $5 per share, which Nevsun (TSX: NSU) dismissed saying it contained “serious deficiencies”. Nevsun CEO Peter Kukielski told Mining Journal earlier this month that if companies wanted high quality assets, they had to “pay up for them”. Lundin said its proposal of $4.75 cash per share was an 82% premium on Nevsun’s closing price on February 6 when Lundin first made an offer to acquire the Timok copper-gold deposit in Serbia. 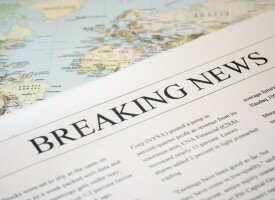 The offer is a 13% premium on Nevsun’s closing price on Monday of $4.21/share. 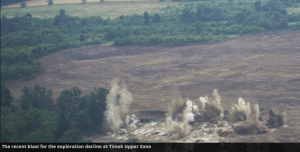 Nevsun last month announced a maiden resource for the Timok Lower Zone, its joint venture with Freeport-McMoRan, of 1.7 billion tonnes inferred containing 31.5 billion pounds of copper and 9.6 million ounces of gold. Nevsun owns 100% of the Timok Upper Zone and 60% of the Bisha copper-zinc mine in Eritrea, where a two-decade “state of war” with Ethiopia ended this month.